What initially drew me to Lauren Child's books was definitely her signature collage style artwork and mesmerizing illustrations. They captivated me from the moment I opened the book. Then I was introduced to the main characters, Charlie and Lola. These endearing characters create an instant connection with their readers because they are such real, funny, and lovable kids. Have you ever looked forward to something so much only to realize it is all sold out or no longer available? At the library, Lola just HAS to get Beetles, Bugs , and Butterflies, her most favorite book in the whole world. She looks and looks and is left to discover the unthinkable- it's not there! Lola is beside herself. How could this happen? Beetles, Bugs, and Butterflies is Lola's book and more importantly, what does she do now? In a hysterically funny and thoughtful way, Charlie helps his little sister Lola discover that there are many more wonderful books just waiting for Lola to discover at the library. After all, what are big brothers for? Can your really have to much of a good thing? In Snow Is My Favorite and My Best, Lola learns this lesson first hand, along with a little help from her big brother, Charlie. When the weatherman predicts snow, Lola absolutely cannot wait. Snow means sledding, and snow angels, and snow doggies, and hot chocolate. Snow is Lola's favorite thing. She wonders, "wouldn't it be great to have snow all the time?" 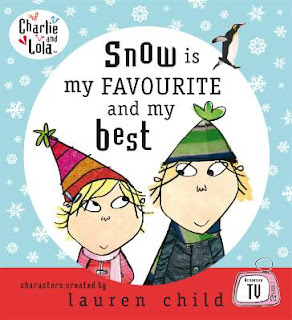 In Snow Is My Favorite and My Best you'll join Charlie and Lola in the Arctic and Antarctic as they meet some new furry friends. Charlie helps Lola discover that while snow is very fun, having it all the time might get a bit old. This is a story about a little boy named Herb. Herb liked reading, but he Loved reading storybooks. He wasn't a very good reader, but it didn't matter because he could tell a lot from the pictures. One night, Herb couldn't find any of his picture books and the only book he managed to find was a book of fairy tales. 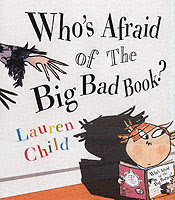 In this book, Lauren Child takes her own creative and unique twist on the everyday fairy tale. I thoroughly enjoyed reading each Lauren's books. They are each very similar in that, she incorporates characters that all children can really relate to. Personally, I believe that this a major component to what makes Lauren such a successful writer. She is clearly in tuned with her audience and how to reach them. Just like in the simple fairy tales we all have known and grown up with, Lauren writes about life lessons that can be found in each of her books. Whether the lesson is trying something new, or appreciating what you have, Lauren is undeniably very creative in presenting these idea's through her stories. What sets Lauren apart from other children's writers is her illustrations. She has become famous for using many different mediums including magazine cuttings, collage material, photography, as well as traditional watercolors. Her illustrations can be considered a work of art. 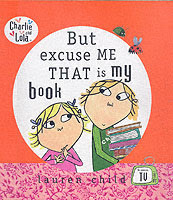 Lauren Child has revamped traditional children's books. I have very much enjoyed learning about her as an author and getting to know her endearing characters. She is writer you should know!